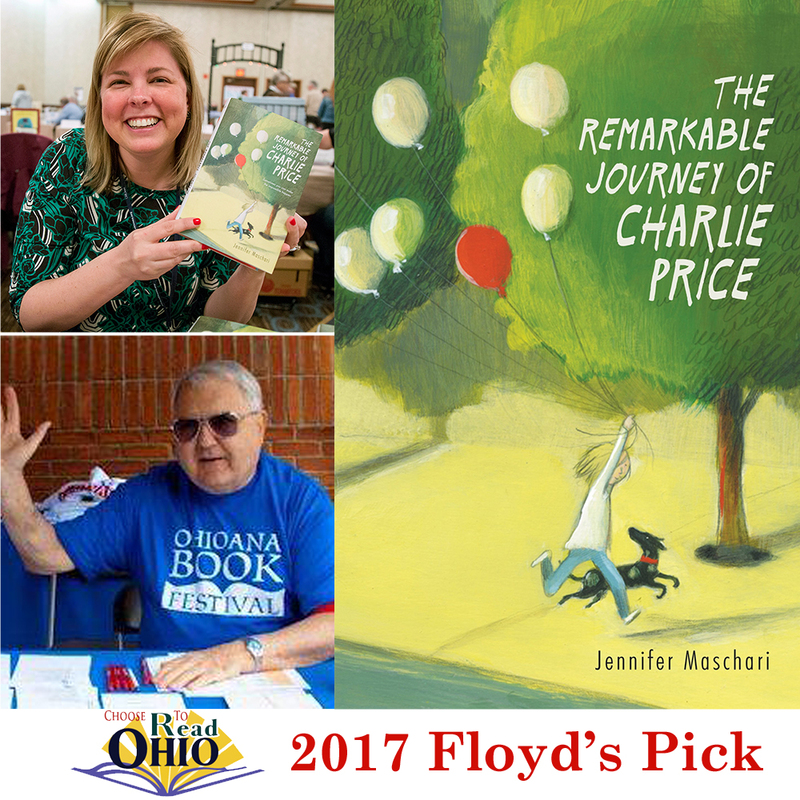 The State Library of Ohio and the Choose to Read Ohio Advisory Board are pleased to announce that The Remarkable Journey of Charlie Price by Jennifer Maschari has been selected as the second annual Choose to Read Ohio (CTRO) “Floyd’s Pick” title, in memory of children’s literature expert, advocate, and librarian Floyd Dickman. The CTRO Advisory Board established Floyd’s Pick in December 2015 with a proclamation by Beverly Cain, State Librarian of Ohio. The proclamation recognized Floyd as a founding member of the CTRO Advisory Board, and praised him as a beloved state and national expert and advocate for children’s literature. For more on the original proclamation, go to: library.ohio.gov/news/6012/. Each year, the CTRO Advisory Board will select an outstanding book in Ohio children’s literature to be Floyd’s Pick. This selection will be in addition to the 20 titles featured in the biennial CTRO booklist. The inaugural Floyd’s Pick selection was Little Tree by Loren Long. Jennifer Maschari grew up in Cincinnati and now lives in central Ohio. She is also a classroom teacher who has taught science and language arts at the middle school level. Her next novel, Things That Surprise You, will be published by Balzer+Bray/HarperCollins in September 2017, and she is working on a third novel. Visit Jennifer Maschari’s website (jenmaschari.com/) or the HarperCollins website (harpercollins.com/9780062380128) for more information about The Remarkable Journey of Charlie Price. Floyd Dickman passed away in June 2015. He was a Library Consultant at the State Library and retired in 1999 after 23 years of service. Floyd’s legacy is an enduring imprint upon library and literacy services in Ohio and across the country. The State Library of Ohio Board’s retirement resolution at that time recognized Floyd’s leadership, commitment, and passion for library services, children’s literature and family literacy. He also received praise for his dedication and compelling enthusiasm to teaching and mentoring librarians and library science students. During his career he was awarded the Ohio Library Council Librarian of the Year and Outstanding Friend from the Ohio Family Literacy Task Force. Choose to Read Ohio (CTRO), a project of the State Library of Ohio, Ohioana Library, and Ohio Center for the Book, encourages public libraries, schools, families, and others to build a community of readers and an appreciation of Ohio authors, illustrators, and literature. The CTRO Advisory Board makes recommendations on statewide implementation of CTRO including marketing, toolkit development, title selection, program sustainability and future growth. The 2017 & 2018 CTRO booklist was featured at the 2017 Ohioana Book Festival on Saturday, April 8, 2017. Explore the booklist, and download free readers’ toolkits for all 95 CTRO titles since the program’s inception in 2009: library.ohio.gov/ctro. Photo credits: Jennifer Maschari photograph by Mary Rathke and Floyd Dickman photograph by Elizabeth Nihiser.